Image via PEN World Voices. Art by Kenyan artist, Wangechi Mutu. The 11th Annual PEN World Voices Festival of International Literature will bring together over 100 writers from around the world in New York from May 4 -10 2015. The best part - this year's 'new curatorial approach' is on the 'contemporary literary culture of the African continent and its diaspora'. The Festival, which will have events taking place across New York City, will feature both established and emerging writers and artists from around the globe - including Teju Cole, Edwidge Danticat, Mona Eltahawy, Richard Flanagan, Aminatta Forna, Yahya Hassan, Rachel Kushner, Alain Mabanckou, Achille Mbembe, Nico Muhly, Sigrid Nunez, Michael Ondaatje, Luc Sante, Craig Seligman, Tracy K. Smith, and Tom Stoppard. 'rich and eclectic variety of conversations, readings, workshops, and performances celebrating the power of the written word as a vital element of public discourse'. Festival highlights, and there are many, include a diverse group of writers including Aminatta Forna, Lola Shoneyin, Ngũgĩ wa Thiong'o and Binyavanga Wainaina, reading commissioned work exploring their imagined scenarios for global culture and society in 2050; 'a salon-style gathering' where the audience will mingle with writers and artists, including Boubacar Boris Diop, Billy Kahora, Alain Mabanckou, Yvonne Adhiambo Owuor and Véronique Tadjo, over drinks - as hosts lead conversations with the audience on issues vital to shaping deeper understanding between African nations and the West. The Festival will also include panels exploring the African diaspora, the future of queer communities in Africa, the vibrant poetry scenes across the continent, and the roles of bloggers in the literary landscape. Find out more about what's on, here. While it is impossible to expect the festival to be able to cover the entire depth and breadth of literature on the continent and in the Diaspora (the press release even raises that), when looking at the line-up, I couldn't help but think about Maaza Mengiste's tweets last year on the dominance of certain African countries on the literary world stage. There are definitely some amazing writers attending this event, who I would love to see (honestly, I am so excited about this event and I would love to be in New York for it). Still, African literature is also so diverse and this Festival could have been an awesome space to showcase even more of that richness and vibrancy. 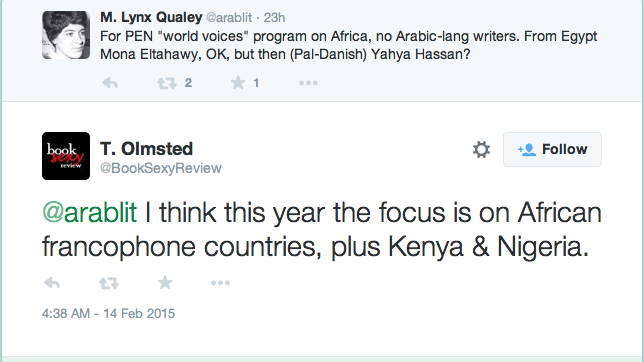 It seems I wasn't the only one thinking that, as Arabic Literature (in English) asked, 'Which African Voices?'. The post also points to the fact that the Festival 'could be an opportunity to explore things differently', such as French-language African writing from Algeria and Morocco, 'but the opportunity is missed'. This doesn't make the Festival any less great and certainly shouldn't take away from the fact that there is going to be a week long festival in May in different parts of New York celebrating African literature. For that, I am thankful, very excited, and if I am being honest seriously jealous that it's happening in New York. Find out more about the Festival on the 2015 PEN World Voices website. Tickets for all Festival events are also available there.